It’s hard to believe that after two days that felt like May, we are talking about snow on the horizon, but that is the case in the WTOP area. Storm Team 4 meteorologist Lauryn Ricketts explains what's coming and when it will arrive. WASHINGTON — It’s hard to believe that after two days that feel like May, we are talking about snow on the horizon, but that is the case in the WTOP area. Temperatures will come crashing down overnight Wednesday night, and that’s about the time we will see some precipitation moving through the region. This could make for some messy commuting in parts of the region Thursday morning so plan ahead. Thursday is a Storm Team 4 Weather Alert Day. I know, it is difficult to believe. A cold front will pass through the region Wednesday and slowly sag to the south eventually stalling out through central and southern Virginia. An area of low pressure will develop Wednesday evening along the front in the Tennessee Valley. 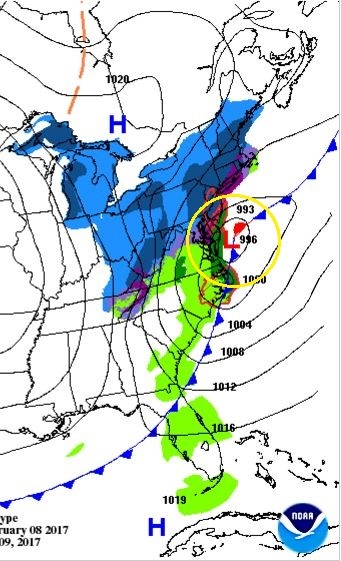 The area of low pressure will track northeast along the front, pushing through Central Virginia Wednesday night and off the coast of the Chesapeake Bay rapidly by early Thursday morning. During the day on Thursday, that low will continue to track close to the northeastern coast of the United States taking the snow with it but leaving some blustery winds in its wake. We are looking at a dry day Wednesday, with temperatures in the 60s, but temperatures will continue to fall Wednesday night as winds shift from the south to the north. Cold air will filter in and temperatures will gradually fall. Rain will push into the region after 9 p.m., and as temperatures continue to drop, that rain will turn to wet snow from the northwest to the southeast overnight. Expect a changeover from rain to wet snow to occur in Hagerstown and points north after midnight. 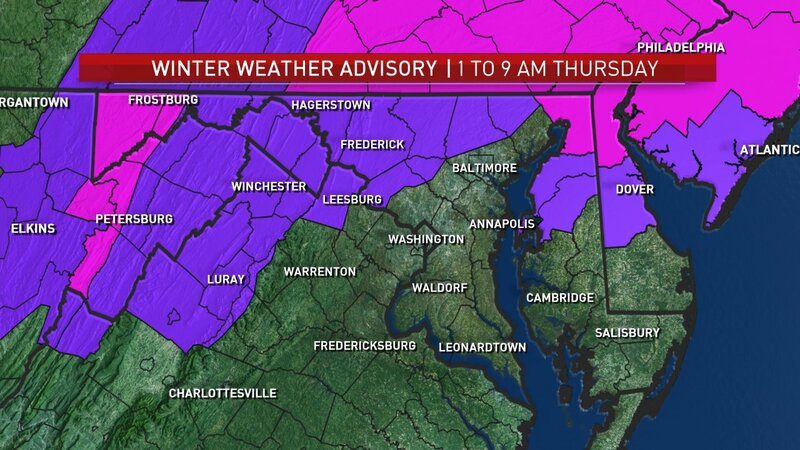 A Winter Weather Advisory will be in effect for some areas (in purple) starting at 1 a.m. Thursday. Between 3 a.m. and 5 a.m., a change from rain to snow will occur from the Northern Shenandoah Valley through Frederick and northern Montgomery counties to Baltimore. 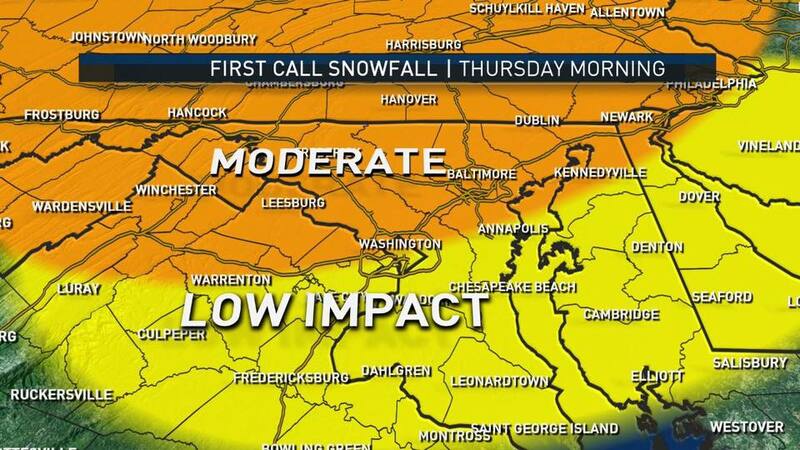 After 5 a.m., the change will start in the Greater Washington area — expect a changeover to light snow in Southern Maryland after 6:30 a.m.
Around 8 a.m. to 9 a.m., the snow showers will gradually come to an end, but we can’t rule out flurries around the area through the remainder of the day. The whole event should last eight to 12 hours, depending on where you are. You may be wondering how we can get snow to stick after two days with temperatures in the 60s and 70s. 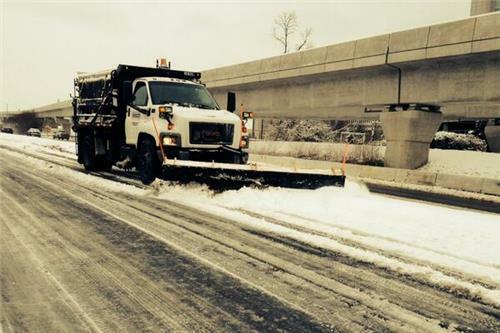 Well it can happen — if the snow rates are strong enough to overcome some of the warm road temperatures, it will eventually stick. 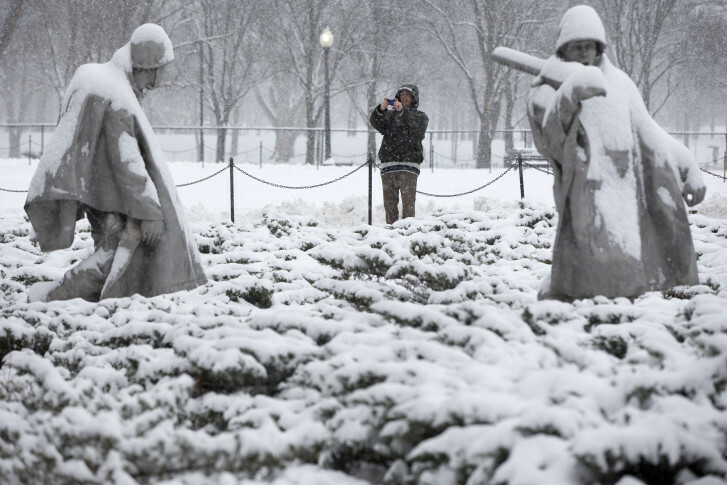 The St. Patrick’s Day snowstorm on March 16-17, 2014, was preceded by days with highs of 60 and 70 degrees respectively, and yet and 3.3 inches of snow fell and stuck in D.C. — with higher totals outside the Beltway. I am concerned that the roads will be difficult to treat, given that we will have rain at the onset before the changeover to snow. Therefore I expect some problems during the morning commute on Thursday. Initially, we will see the snow melt on contact with the roads, considering road temperatures are in the upper 50s in a lot of spots. Eventually that temperature will drop, though, and snow will gather, especially north and west of D.C., where it will be snowing longer. Snow will wrap up in the region around 8 a.m. to 9 a.m., leaving blustery winds and a few flurries; there will not be accumulating snow all day. 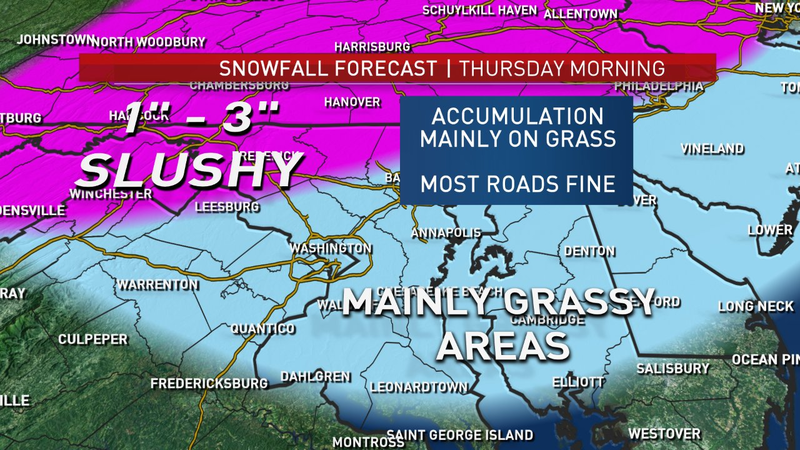 While around the Greater Washington D.C. area we are just looking mainly wet main roads with a possible coating or slick areas on some of the secondary areas, overpasses, exit ramps and bridges, we will have some minor accumulation. Further north and west, the snow rates will create some problems, overcoming some of the warm ground temperatures and leaving some slushy accumulation on area roadways — which, again, will create some problems for the morning commute. Before 8 a.m., some heavier snow bands could wreck visibility — another thing to watch for early Thursday morning. Plan on delays Thursday morning, both on the roads and area schools, with cancellations even possible. 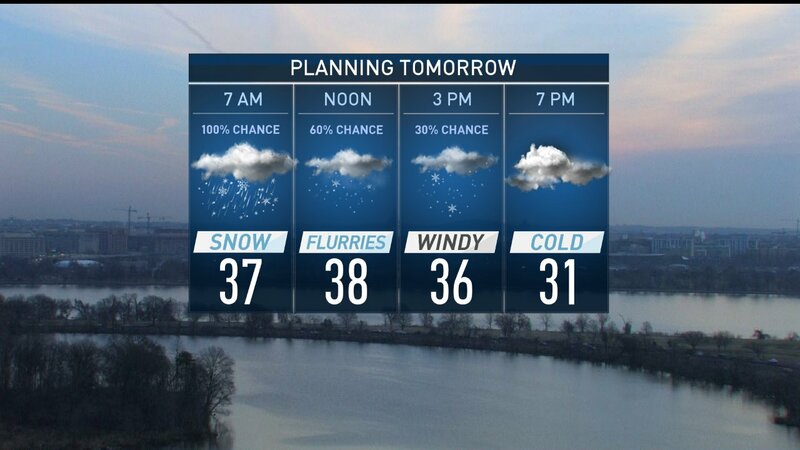 The snow will wrap up around 9 a.m., leaving a cold wind behind. Winds will gust up to 30 mph at times, and with temperatures only in the upper 30s for daytime highs, it is going to feel more like the 20s for much of the day and feeling like the teens late Thursday night. There could be some black ice on the roads, not only Thursday night but also Friday morning, though I am hoping the wind will help dry out the roads. Either way, be careful traveling around both Thursday and Friday. The good news for warm-weather lovers is that temperatures will warm back into the 50s and 60s just in time for the weekend, so go ahead and make those tee times!